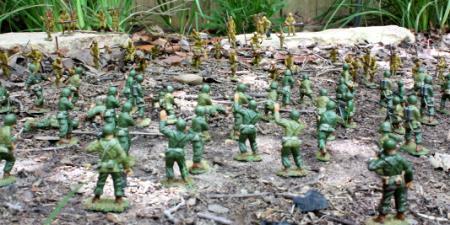 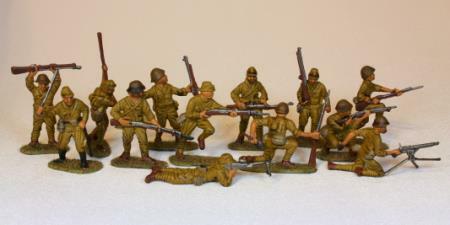 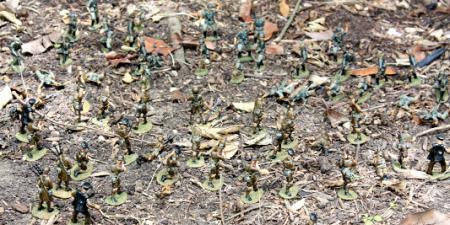 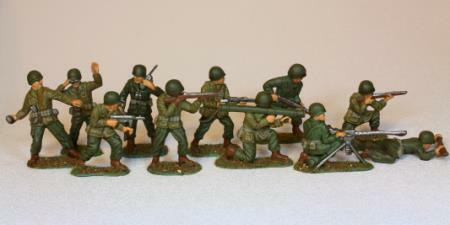 This article describes a quick method of painting plastic army men.Many children of the Baby Boomer and the G.I. 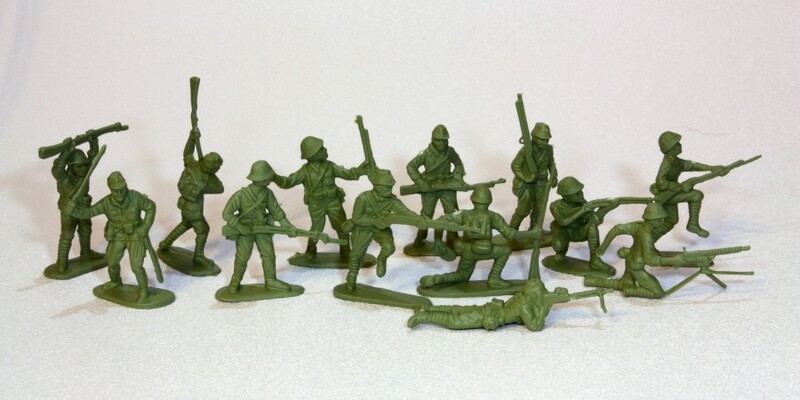 Joe generations will rememberplaying with buckets of inexpensive plastic soldiers.Back in the 1950s and 1960s, these army men often were made by companies suchas the Louis Marx Toy Company.Many of the poses of the figues were based on famous photographs from World War II.The miniature figures were sold unpainted, and they were plentiful and cheap.Many a child played with the figures in the yard.Many a figure was lost to avalanches, burials, junior pyrotechnics, and fire.If you were like me and my friends, you would occasionally find one many yearslater while mowing the lawn or digging a garden, and it brought back memories. These days the figures are no longer made by Marx.Many of the figures are made in China.This particular set is made by the HingFat toy manufacturing company of China.here are 4 nationalities each in its own color, and at least 12 poses per nationality.You get a good variety and a good quantity for the price.Although many of the poses will be familiar, in reality these figures are slightly smallerand less detailed than the Marx figures. 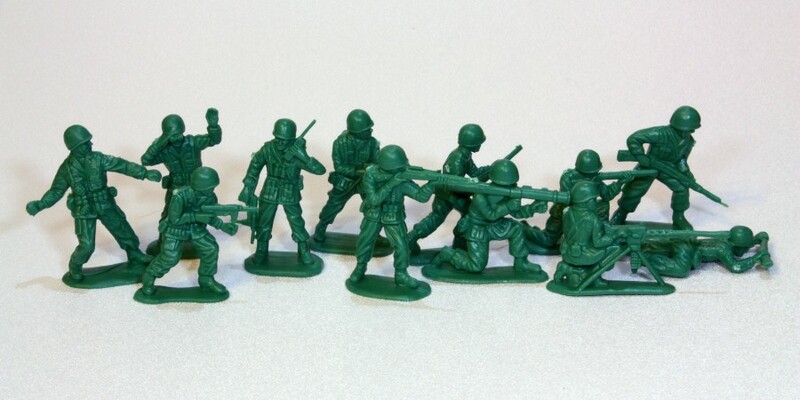 They are also molded of a harder plastic thatwill snap more easily than the classics. 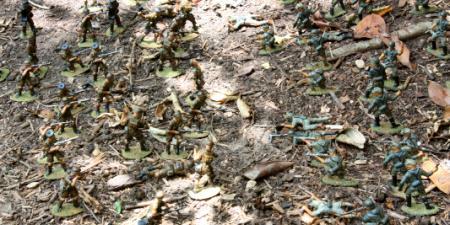 You can see lots of sprue twists and mold linesin the figures. 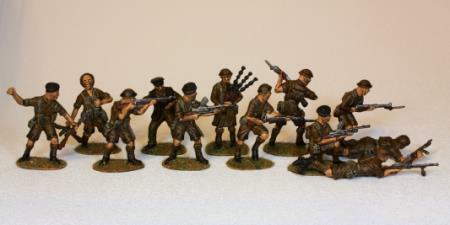 Sculpts are not very crisp. 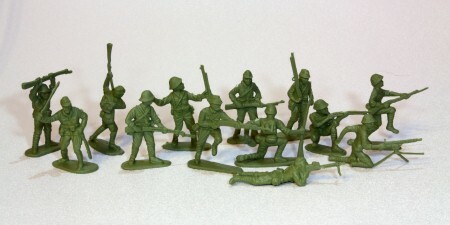 Some of the poses are slightly out of scaleas if the molds were acquired from different sources.The Japanese soldiers in particular look like a slightly smaller scale than the others. So, given the cheapness and the poor quality of these figures, why would anyone wantto invest time painting them.Well, for one, they look much better painted.And two, utilizing some quick painting techniques, you actually can paint a large bucketsomewhat quickly.And once painting the photos and games with these figures look much better too.Finally, if you spend hours detailing and painting eyeballs on expensive lead figures,it is both a pleasure and a skill-builder to learn to paint many figures quickly.So, in the end I think the value of the figures improves much for little input. 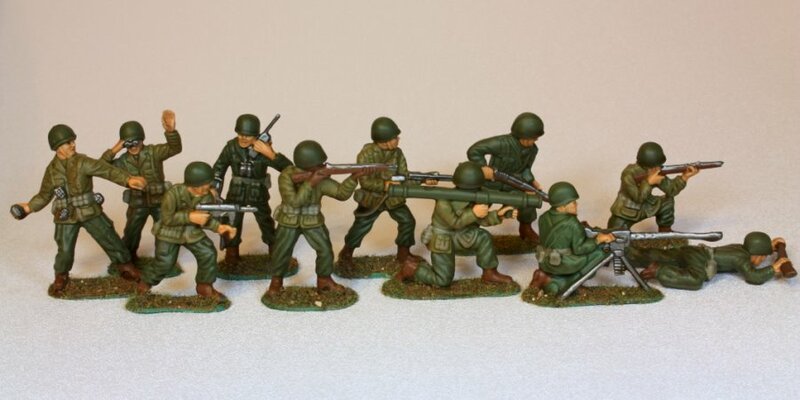 The photos above show the American army figures.First the uniforms were painted with a mix of olive drab and khaki green colors.Then the fleshtones were painted in.Next, the webbings and ammo holders were painted in khaki.Then boots and rifle butts were painted with an earth brown.Finally metal pieces were painted with blackened silver.In most cases I used Vallejo or Reaper acrylics, but the metallic paint was Games Workshop.Once the figures were dry, they were dunked in MinWax Polyshades Tudor paint to give thentheir shading.The shading tends to darken the figures, but it also highlightsany sculptural effects and brings out the details.The PolyShades stain/polueurethane is spirit based and messy, but unlike water-based inks and washes,the PolyShades is consistent and insensitive to the paint finish.After nearly a week of drying, the base was sprinkled with somes static grass,and the entire figure was sprayed with Krylon Matte Varnish. 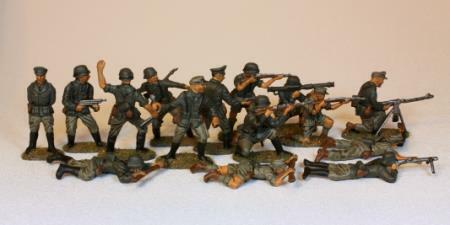 The photos at right show the German army figures.These minis look like they came from multiple sets.One set has a European Heer uniform while the other set seems to have Afrika Korps uniforms.I painted the uniforms a mix of German uniform gray and gray-green.Black boots for the European uniforms, brown for the Afrika uniforms.Let them dry and djunk them in MinWax.Flock the base and paint matte varnish. The photos at the right are of the British army.Like the Germans, this figure selection looks like it comes from twosets.There are early war uniforms with the saucer helmets.Then there are late war uniforms, perhaps even modern, with the black berets.Many of the figures have the Africa shorts.It makes me chuckle that there are about 3 bagpipers and 8 captains in the mix.I can see one or two, but why do you need 8 of these captains?Are we to simulate a D-Day waterborne invasion? 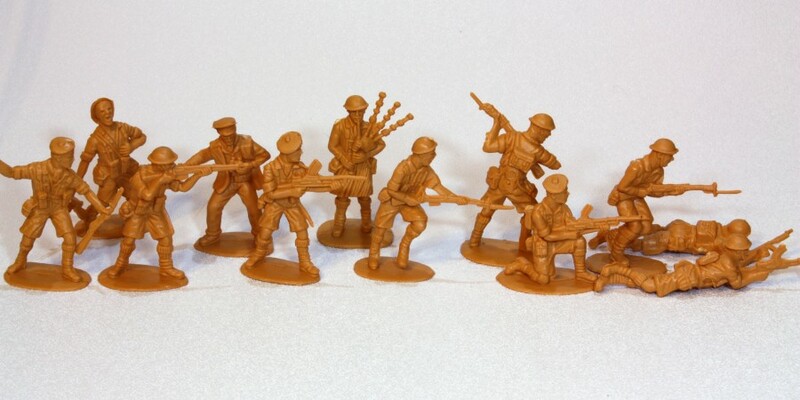 Notice the MixWax polyurethane is a little heavy on these figures.The Tudor satin is one of the darkest browns next to Black.For lighter figures you might want to use the Pecan shade.Avoid the Walnut color. 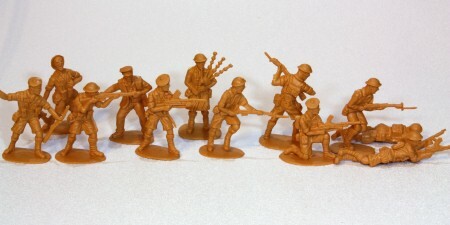 It is too red.In this case I was experimenting with the mix of the Tudor stain.Normally I give the polyurethane a gentle shake or two before dipping figures.Here I gave the cans a complete mix and shake, and the figures are noticablydarker.You also can use a brush to remove any pooling or obviously dark areas (which Idid not do here).Experiment to get the shade you like. To the right are the Japanese army.These figures seem to be a slightly smaller scale than the other ones on this page.Although the sculpts are a little less detailed, there are some good animated poses here.I particularly like the officer with the samurai sword. 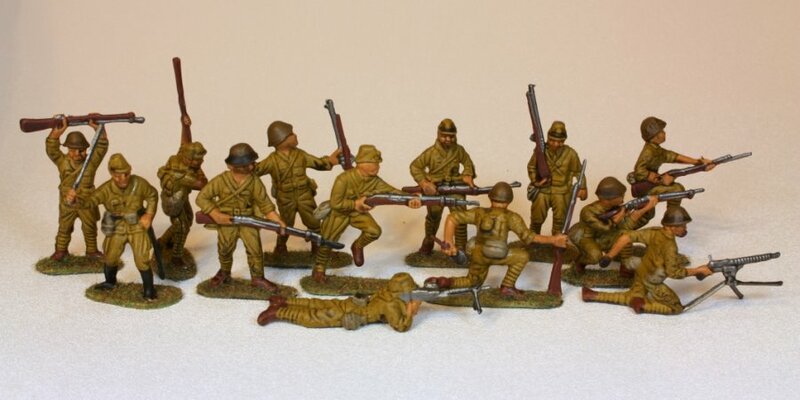 These troops are painted much like the others.The uniform is Vallejo VP 117 "Japanese Uniform WWII".The MinWax polyurethane was only given one or two shakes before dipping.You can see the effect is more subdued from the Brits above. Enough of the studio poses.Here are the American and Japanese armies battling in the Guadalcanal jungle,a.k.a. 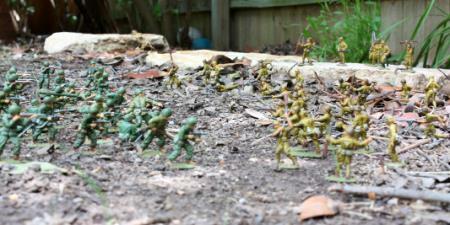 the backyard.I was in such a hurry to take some photos, I shot the battleat high noon.This is not the best time of day to shoot.You get better photos from a diffuse light on a cloudy day, but I guessthese photos illustrate thecoolness and awesomeness of a massive infantry battle in the backyard. 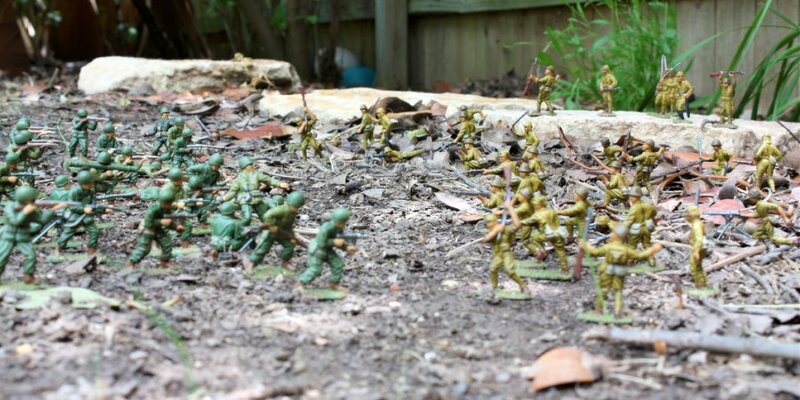 These photos show the Brits and Germans battling in the Belgium forest.Surprisingly, it looks very similar to the Guadalcanal jungles,well that's because it is the same backyard.Again, the clear sky and high sun makes for too much contrast, andit is difficult making out the figures.However, you can see the captains in their black pea coats urging thearmed troopers forward. 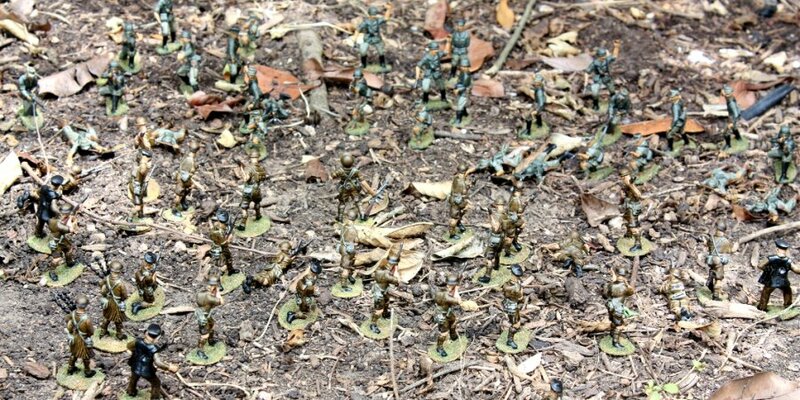 Thanks for reading about my painted plastic army men.I hope you learned a few tips and can appreciate that it is funto paint up a bunch of toy soldiers.There are many free rule sets for battling with these plastic troopers,and painting the figures helps you enjoy the battles more.More miniatures and scenery photos are locatedat the Miniatures section. 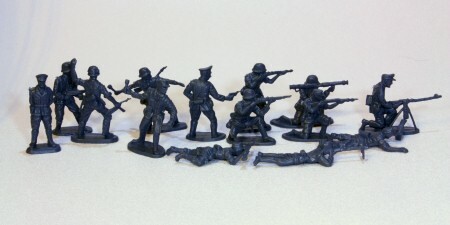 Last modified: Thursday, 09-Jun-2011 12:53:58 MST.